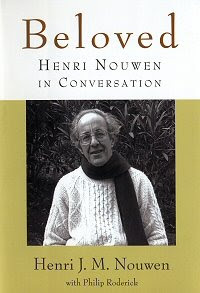 I was introduced to Henri Nouwen by a dear friend some years ago. She showed me where to find little extracts on the internet and I read them avidly for several years. The collection cycles round annually so eventually they become quite familiar. Even so, I'm still signed up to the mailing list and read them from time to time. This year she sent a small book in which Philip Roderick asks Henri Nouwen a series of questions. The answers do not disappoint! You can try the daily extracts for yourself by visiting the website HenriNouwen.org and signing up on the Free eLetters page. The short book (one of many) is called 'Beloved', you can find it online at Amazon or order a copy through any good bookshop. So why do I like Henri Nouwen's writings so much? Thoughtful writing - The main reason is that he was such a contemplative believer. He wrote nothing without thinking about it carefully and, one suspects, long. His life was spent in serving others, and sharing in community with them. He lived in a l'Arche community for the mentally handicapped for some years, sharing his life with those who could not care fully for themselves. Everything he said, did, or wrote came from a heart of love, gentleness, and caring. Most important of all was Henri's deep understanding of the heart of Christ. He knew there was a depth of love and caring in Jesus and in the Father, and that only when that is reflected in our own hearts and lives can we truly claim to be his children. You can get a glimpse of this by watching the video. Wikipedia has a short article on Henri Nouwen. It provides a basic biographical introduction, some good quotations, and a bibliography. You cannot live in communion with God without living in solidarity with people; it is essentially the same. We were expecting to meet with Pete and discuss the proposed summer youth camp again. But his son, Alex, phoned just before the meeting to say he's unwell and would not be able to join us. We prayed for Pete's health and comfort, and also for others who were not with us tonight - Paul, John, Roger, and Ruth for example. We spent a while talking about the Holy Spirit, how he is a help and comfort to us in our individual lives, how he reveals Christ to us, how without him we would only be able to do the physical parts of our Christian lives (reading, praying, teaching, sharing). We thought that when we rely on him he enables us to partake in the spiritual nature of the Father and the Son. He is given so that we can not only see the Lord in all his spiritual aspects (though imperfectly) but also grasp something of his spiritual purposes and ways of working. And as we glimpse him more and more, so we begin to grow more like him. He is not in the business of changing our behaviour, instead he wants to change our hearts and then we will naturally do the things we need to do. 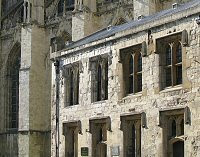 We had a picture of a stone-built courtyard, the masonry looked like a cathedral or castle style of building. The courtyard was paved with flagstones and in the centre was a circular stone plinth. Above the plinth was a sparkling figure, it was Jesus and he seemed to be half present and half absent, rather like the halfway stage in the Star Trek transporter. He is coming, he is not fully here yet but neither is he fully absent. 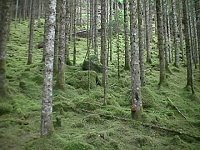 We can see him but we still don't see him fully, but he is coming and we will see him. Although we don't experience him completely, he is with us. We chatted for a while, then Jody shared something about walking through the mud and how their children had got stuck and got their clothes muddy in trying to take a step forward. Chris realised that it's as though we are walking along a dark path carrying torches, the source of the light moves along with us because we are carrying it. So although everything around is is in darkness, the place where we put our feet is always clearly lit. 'No matter what happens in your life, I'm still here. Take heart, don't worry, I am your Rock. This was the first time we have met during the daytime. Chris, Roger and Paul met at 10:30, we chatted for a time, spent a little while in prayer, and had bread and soup for lunch. John wasn't able to come as he was collecting his daughter from the airport. It was a great time and we'd like to meet again when we can. The daytime suits some of us much better than the evening. Rachael has been studying recently (which is why we're meeting on Mondays now - she is not free on Tuesday evenings). She's been reading a book about helping people who suffered abuse as children, and this evening she read a letter from the book. The person had written to his mother, laying out very clearly and unemotionally the damage that her abuse had caused. The letter was quite stark, but perhaps the most impressive thing about it was its matter-of-fact-ness. This is what you have done to me, to me you were two different people - my Mum, and 'scary lady'. At one point she had slashed him with a knife and left him alone for hours afterwards. He bled profusely, he might have died. The book might have been called 'Seeds of forgiveness', I'll have to check. We all need to forgive and we all need to be forgiven, our meeting focused on these issues. Imagine this - you are a tailor in a village in rural Ghana, you have little income, just enough to scrape a living. As you reach the ripe old age of 35 your eyes deteriorate and you can no longer see to thread the needle on your sewing machine. You are forced to retire. The problem - a pair of glasses would solve the poor sight but there's no optician anywhere nearby and even if there was, you couldn't afford to pay him. This is a true story. 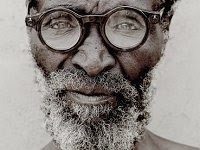 The man in the photo is African, a Zulu, his life has perhaps been transformed by the glasses he's wearing. The Ghanaian tailor's life was transformed in the same way. Perhaps it's not quite true to claim that 'they were blind, but now they see' but it's no exaggeration to say they were short sighted but now they see clearly, clearly enough to be able to read, and work, and earn an income. The availabilty of cheap but effective glasses can transform individual lives and even entire communities. But there's a serious snag. Glasses are expensive for two reasons, first you must obtain a prescription to suit your eyes, and then you have to pay for bespoke lenses made to match the prescription. Opticians and optical labs are expensive, far too expensive for an African or Indian villager. The solution - enter Josh Silver, an Oxford physicist. Thinking about this problem he hit on the idea of creating special glasses that each person can adjust to suit their own eyes. Now he's getting help to roll them out on a larger and larger scale. An article in last month's Guardian (Inventor's 2020 vision) explains how the invention was made, how it works, and how it's being scaled up to help millions, hopefully even billions. It needs powerful sponsors in industry and government but that support is beginning to appear. The future looks promising; not least for the world's short-sighted poor. Prophetic Word - Same old? If you're involved in church in any way this may sound pretty familiar. It's the start of a new year, 2009. It's time for resolutions, plans, and... prophecy? Same old prophecies you heard last year? Hmm... Read this from Steve Hill. Steve and Marilyn are missionaries and church planters working in Central Asia. They know what it means to struggle against the powers of darkness. They know the meaning of praying without giving up. 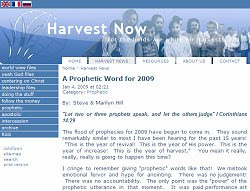 Read the whole of his message 'A Prophetic Word for 2009' at his 'Harvest Now' website.